We’re over the moon! Televisor – our new Spacedog show – featuring humans, theremin, robots, Baird televisor and an unplugged guest appearance from Professor Elemental – has been awarded Best Music Event of the Brighton Festival and Fringe 2011. Thanks to everyone who put in a good word for us and to the Latest 7 Awards committee for embracing our oddity and backing our act. We now plan to take Televisor to more venues, festivals and cities. If you’d like to see and hear Spacedog at your event, drop us a line! 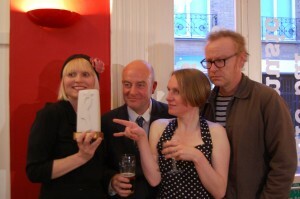 Line-up in the photograph (left to right): Jenny Angliss, Colin Uttley, Sarah Angliss, Stephen Hiscock. Thanks to Peter Crisp for the photo. Thanks to The Brunswick and Bom-Banes for being such generous hosts during the Fringe and to the Marlborough for supporting us in previous years. Also on the shortlist was this Balkan Brass Battle which sounds tip top.